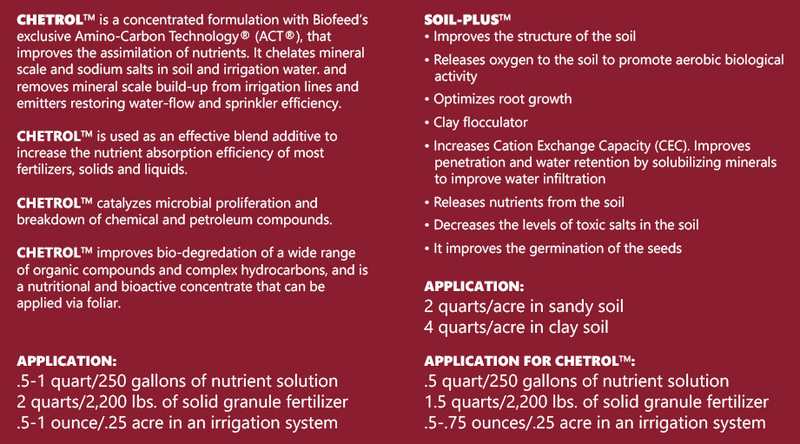 Blog – Page 2 – Biofeed Solutions, Inc.
With CHETROL and SOIL-PLUS you get a more efficient fertilizer. Thanks to the complex power of CHETROL, we increase the efficiency of the applied fertilizer, and obtain a better result using LESS fertilizer. If we combine soil changes with SOIL-PLUS, the results are spectacular, activating degraded soils subjected to a great agronomic pressure, providing benefits to the soil that will contribute to facilitate root mobility and consequently increase the absorption of nutrients….then you can see the benefits we get with the addition of these two products. 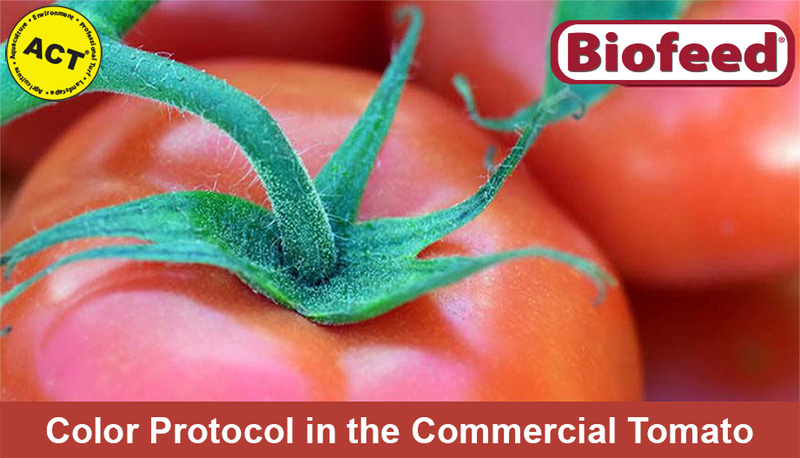 Due to the high need and current problems that exist today to increase yields in the tomato industry, in order to give it color and quality, we propose the following program of treatments with a selection of technological products, very elaborate and novel. Carry out the treatments, always at the first or last hour of the day, looking for the greater stomatal opening of the crop. REBOUND™ Foliar formulation that promotes the translocation of nutrients to consummate the ripening of the crops, improves the movement of carbohydrates and proteins, from the leaves, stems and roots to the crop part, through the activation of amino acids (Methionine) and vitamins A, C, E and D.
Bio-promoter of phenylalanine, methionine, monosaccharides and extracts rich in oxylipines, provides at the same time the precursor (phenylalanine) and the activator (oxilipinas) of the biosynthesis of anthocyanins and flavonols, pigments that give the fruits red, Orange and purple. 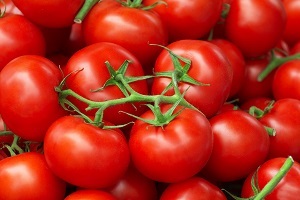 It favors the accumulation of the pigments and, consequently, improves the intensity and the extension of the coloration of the fruits. 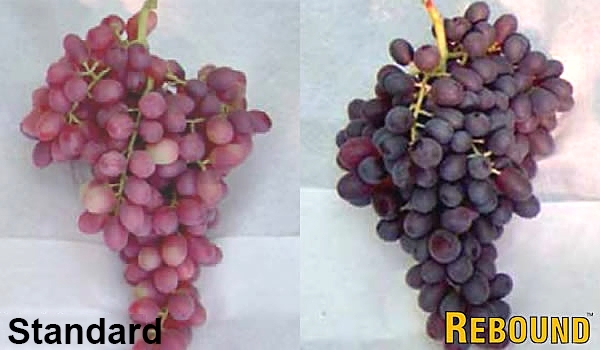 REBOUND™ does not affect the consistency of the pulp and improves the post-harvest life by the activation of antioxidants resulting in a higher quality and color of the fruits. TO ACHIEVE THE DESIRED EFFECT, WHAT CAN BE MIXED? 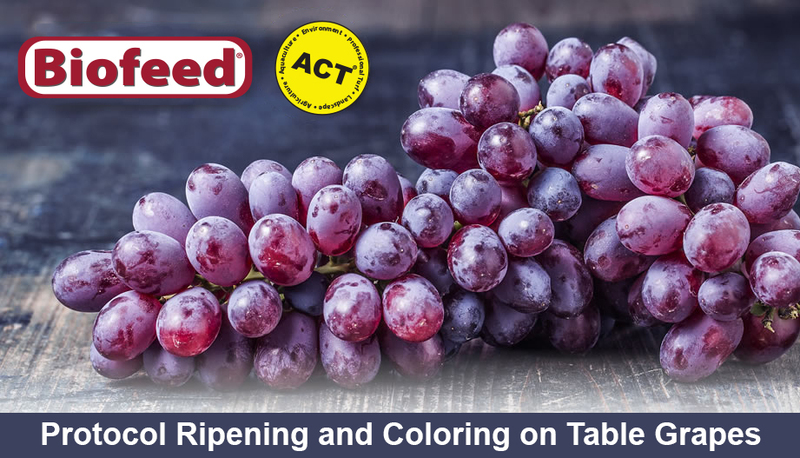 Due to the high need and current problems that exist today in the cultivation of table grapes, in order to give it color, we propose the following program of treatments with a selection of Biofeed products. The fattening and promoters of color are related processes, so we can not work one without affecting another. Having said that, the recommended treatment is aimed at improving each process of the moment by preparing for the next one. REBOUND™ foliar formulation that promotes the translocation of nutrients to consummate the ripening of the crops, improves the movement of carbohydrates and proteins from the leaves, stems and roots to the crop part, through the activation of amino acids ( Methionine) and vitamins A, C, E and D.
Bio-promoter of phenylalanine, methionine, monosaccharides and extracts rich in oxylipines, provides at the same time the precursor (phenylalanine) and the activator (oxylipines) of the biosynthesis of anthocyanins and flavonols, pigments that give the fruits red, orange and purple. Achievement Effect – With REBOUND™ Get 70% More Color! 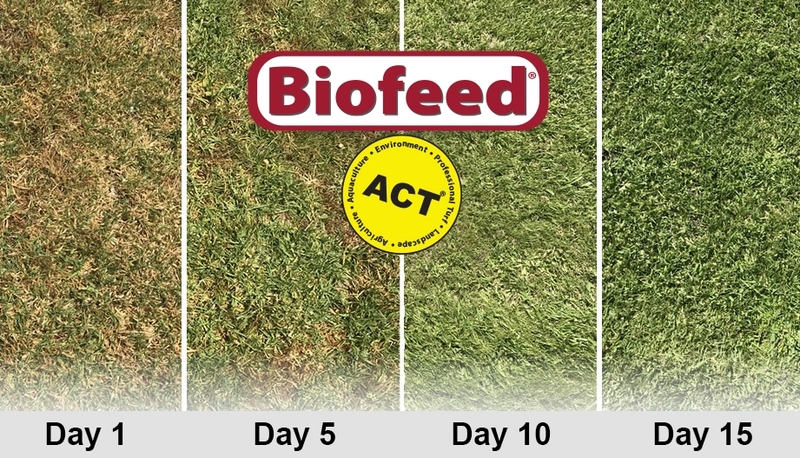 Today from Biofeed, we show you the spectacular results of the application of Biofeed products in lawns. After the application of Soil-Plus on the lawn, the soil began to respond, holding irrigation water and providing a healthy balance and increasing its fertility. Undoubtedly, one more triumph of Biofeed products. 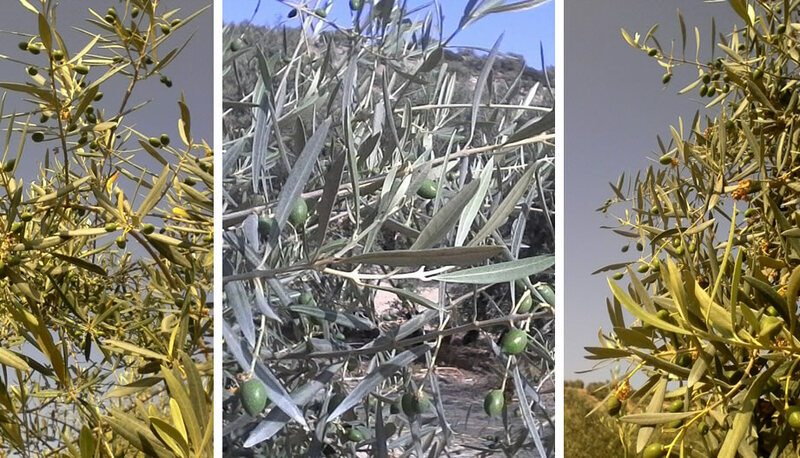 Today, we received these images from one of our clients with an Olive estate. This farm did not offer prospects of a harvest like the one that has resulted. 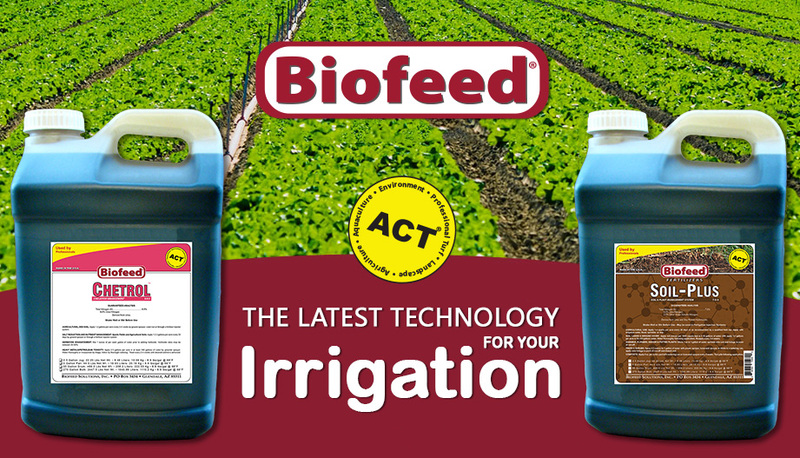 As usual, the application of Biofeed products surprised us again with a harvest that we did not expect to have. We have already prepared the treatment for next week with Crop, Cal-Plus, Chetrol, and K-Pro to harden the bone as soon as possible, in anticipation of the high summer temperatures and the drought that we suffer.